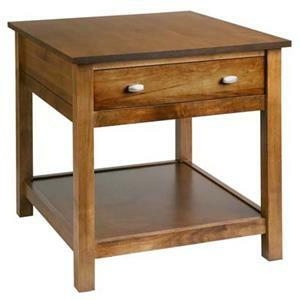 Simple in structure and style, this modest end table is a quality piece to place in your home. 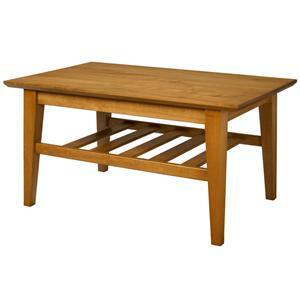 Crafted from red oak, it features a rich Golden Oak stained finish that highlights the natural beauty of the wood. 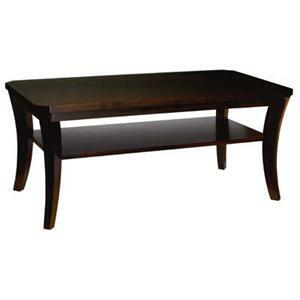 Rectangular in shape, it features straight, solid legs and slats that lend a balanced and symmetrical design to the piece. One small center drawer provides the perfect place to tuck away small items and a lower shelf offers additional space for placing books, magazines, or home accents. 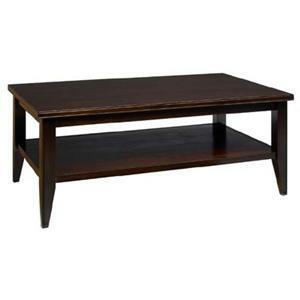 Create the perfect place to rest your remote controls, drinks, or reading material in your living room or family room with the simple style of this condo cocktail table with one shelf. The casual elegance of the design will blend in beautifully with any decor of your home, only highlighting everything around it. The solid maple top is combined with graceful profiled legs that are molded together by a shelf, giving you more room to store your living room essentials. The casual elegance of this sofa table with shelf will allow you to gracefully complete the decor of your home in style. 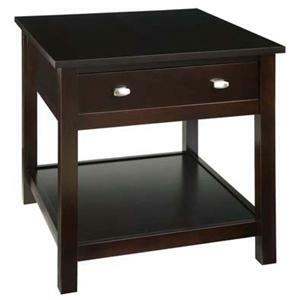 The generous 1.5 inch solid maple top is combined with graceful profiled legs that are molded together with a shelf. 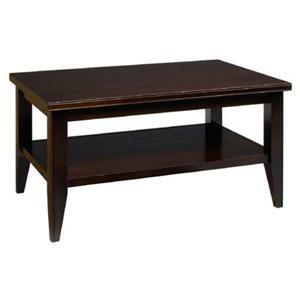 Straight clean edges and slightly tapered legs create the simplified style of this table that will effortlessly blend in with any decor of your home. A thick slatted bottom shelf and tapered legs adds the contemporary transitional touch to this cocktail table making it functional in both casual and formal environments. Place books and magazines on bottom shelf for easy access. 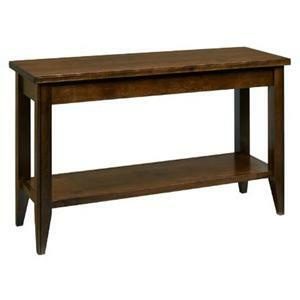 Constructed in solid maple wood and carefully selected maple veneer rails this table promises sturdy, long-lasting support. Customize your cocktail table with the option of several primary maple stains and all of the Custom Color paint and finish options for a look that matches your home. 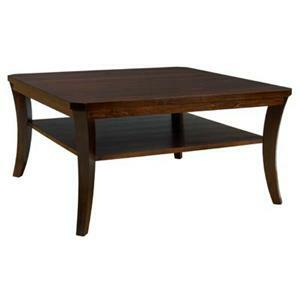 Accent the interior design of your living room or family room with the casual yet idyllic style of this end table. The clean uncluttered lines are a refreshing change and enhance the natural beauty of the solid maple, creating a piece that is as durable as it is stylish. The top drawer is accented with brushed nickel hardware and is perfect for storing remote controls, TV guides, or other reading materials. The bottom shelf and the table top can serve to display your favorite collectibles or picture frames. 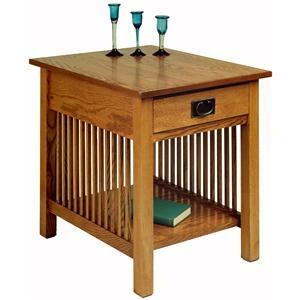 For well over 100 years the A.A. Laun Furniture Company has manufactured fine home furnishings. Our tradition of designing and manufacturing quality occasional tables, entertainment consoles, and accent items began and continues in Kiel, Wisconsin, USA. Our products are sold at furniture retailers throughout the United States and Canada. Even with the latest in technology, there is no substitute for the dedicated craftsmanship of our employees, making beautiful furniture at A.A. Laun Furniture Company, and treating each piece of furniture as if it’s their own. Creativity is the lifeblood of the furniture industry. We pay close attention to fashion trends and listen to our customers. While most of the furniture sold today is imported, one of our main advantages is manufacturing in America. We can respond quickly to changes in the marketplace, having a new design in production and finished to a consumer’s specifications in a matter of weeks. 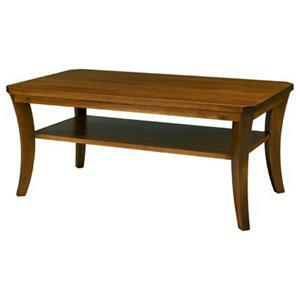 We offer a wide selection of real wood furniture items—no particle board—which showcase our ability to process solid wood. Even where it’s appropriate to use plywood, we use nothing but the highest quality wood veneered panels. While many furniture manufacturers have gone to nails and staples, we still rely on traditional screws and dowels for quality construction. Our drawers are solid maple English dovetailed drawer boxes, most guided by a full extension side mounted slide that gives them a quality fit and feel.